1. 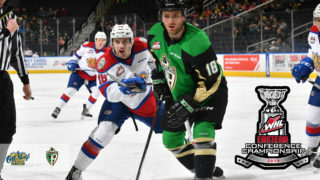 Trey Fix-Wolansky, Edmonton Oil Kings: Columbus Blue Jackets prospect and Edmonton Oil Kings captain Trey Fix-Wolansky added three more points to his league-leading total Monday in a 6-4 win against the Lethbridge Hurricanes. Fix-Wolansky scored Edmonton’s third goal, then added assists on his team’s first and fifth goals. The Edmonton, Alta. product now has 45 points (13G-32A) in 22 games this season, leading the league in assists and points. 2. Zachary Cox, Lethbridge Hurricanes: Zachary Cox recorded the first multi-goal game of his WHL career in Monday’s 6-4 loss to the Edmonton Oil Kings. 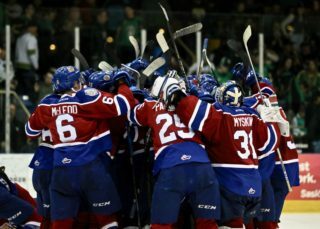 Cox scored Lethbridge’s third and fourth goals of the contest at even strength with both coming in the third period. Cox now has seven points (6G-1A) in 17 games this season, surpassing his point total of six from 58 games last season. 3. 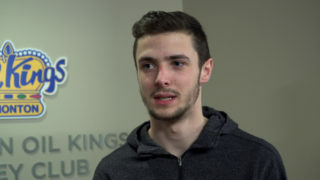 Vince Loschiavo, Edmonton Oil Kings: Vince Loschiavo scored the game-winning goal and added an assist Monday as the Edmonton Oil Kings defeated the Lethbridge Hurricanes by a 6-4 final. Loschiavo’s two-point performance was his seventh multi-point game of the season and gave him 19 points (10G-9A) in 17 games. The night also marked the first career multi-point game Loschiavo had recorded at the Enmax Centre. 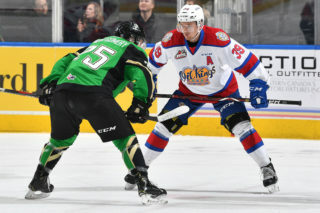 The trio of captain Trey Fix-Wolansky (Columbus Blue Jackets), Brett Kemp, and Quinn Benjafield combined for nine points Monday as the Edmonton Oil Kings rolled to a 6-4 win over the Lethbridge Hurricanes in southern Alberta. Edmonton began the game with a bang as an angled pass by Vince Loschiavo to Kemp was deflected in by the latter just 14 seconds into the game, giving Edmonton the all important 1-0 lead. The Hurricanes would come back 11:07 into the period as 2019 NHL Draft prospect Dylan Cozens picked up a turnover, then elected to shoot on the odd-man rush, sniping the puck past Dylan Myskiw to get the home side on the board. 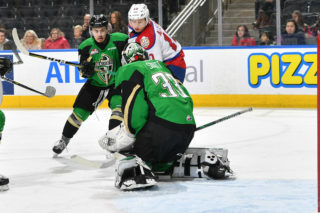 Another turnover led to the next goal of the game as the Oil Kings worked to get the puck in the slot to Carter Souch. The puck was then passed over to Liam Keeler, who put the puck past Reece Klassen to restore the one-goal lead, which would stand up after 20 minutes. Like the first period, the second featured an early goal as well as captain Jordy Bellerive (Pittsburgh Penguins) dished the puck across the ice to defenceman Igor Merezhko, who quickly passed it back to an open Bellerive for his ninth of the campaign just 78 seconds into the period. 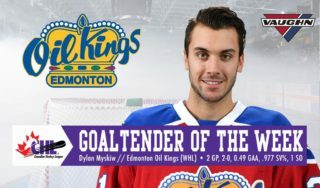 The game belonged to the Oil Kings though, who received a goal from Fix-Wolansky six minutes after Bellerive’s goal then scored with 18 seconds to go in the period as 2019 NHL Draft prospect Vladimir Alistrov set up Conner McDonald for a one-time goal that made it 4-2 after 40 minutes. Though the Hurricanes pressed in the third, it didn’t change the eventual deficit as Zach Cox scored twice only to be followed up each time by goals from Loschiavo and Jalen Luypen, rounding out the game. Myskiw earned the victory, stopping 17 of 21 shots. Klassen stopped 23 shots in the loss.